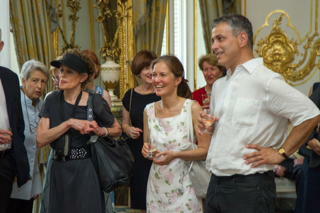 Dozens of AAPA members and their guests ignored a searing heatwave to gather for the association’s annual garden party, held on June 21 at the ornate residence of the U.S. ambassador. 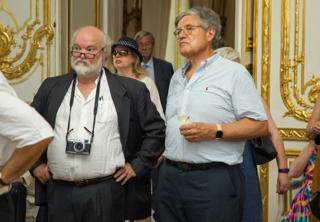 Neither the muggy conditions nor the absence of the host ambassador – still to be named by the Trump Administration – could dampen the enthusiasm of the 58 members and guests who sipped champagne and exchanged banter in the 19th century Hôtel de Pontalba and its manicured gardens. As AAPA President David Pearson quipped in his remarks, the unseasonable heat was a nice change from the rain that had kept everyone indoors at the 2016 affair. 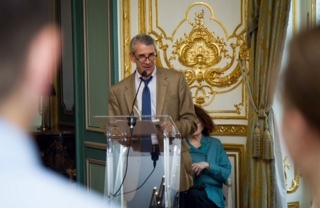 Both speakers from the Paris diplomatic corps – Philip Frayne of the U.S. embassy and Giles Spence of the UK embassy – paid tribute to Stéphane Villeneuve, a French journalist killed in Iraq days earlier, while lauding the work of AAPA correspondents for their hard work in covering and interpreting the news. Reviewing some of the momentous changes in the world over the past year, Pearson noted that there had been 15 terrorist incidents in France alone in the previous 12 months. Looking ahead, Pearson said he hoped the AAPA would be as dynamic over the next century as it had been in its first 110 years – a birthday celebrated this year. Frayne also quoted a story in a 1945 edition of The New York Journal American on UK elections that brought down Winston Churchill’s government – a story by John Fitzgerald Kennedy, whose 100th birthday fell in 2017. Spence — Frayne’s counterpart at the UK embassy – underscored the close ties between his country and France despite Britain’s vote to leave the European Union. He said authorities in the two countries worked together to dismantle 38 human smuggling rings in 2016, and that the value of bilateral trade in 2015 was 78 billion euros. And, he pointed out, the Taittinger champagne house intends to produce 300,000 bottles of sparkling wine at their new vineyard in Kent. With that, AAPA members refilled their champagne glasses.